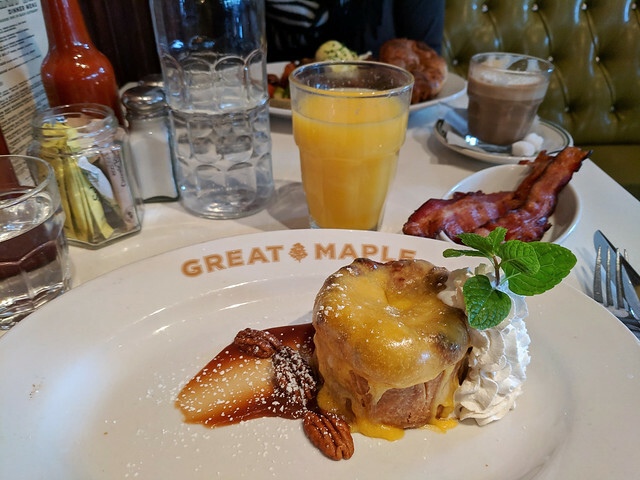 It was an early start for Eric, so we just grabbed a quick breakfast at the hotel and then met for lunch at True Food Kitchen in the Fashion Mall. 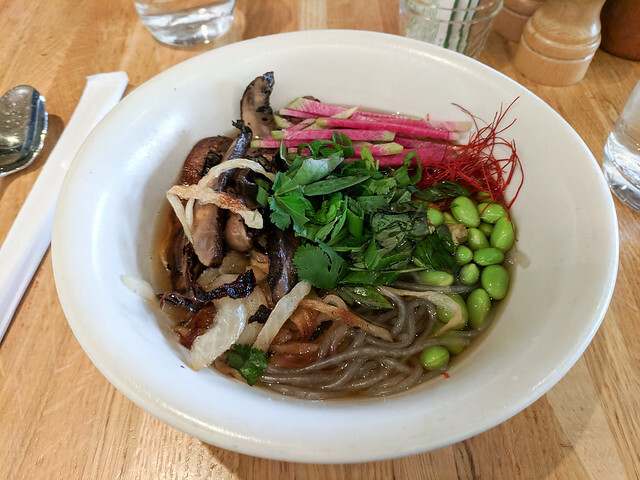 I had the Dashi Ramen bowl with Portobello mushroom, edamame, onion and glass noodles. Eric had the chopped salad. I was underwhelmed with my choice and Eric said his salad wasn’t quite as good as he remembered from last time. We were up in the Miramar area already at another brewery, so we decided to chance a try at Ballast Point for dinner after a call yielded no reservations available. Dropped Eric off to go inside while I waited for a parking spot and we were put on the wait list for 35 minutes. Once at the table we ordered the American Waygu burger with cheddar and the Impossible burger. We decided the real thing was better due to taste but the texture was pretty spot on. Fries were crispy and good. 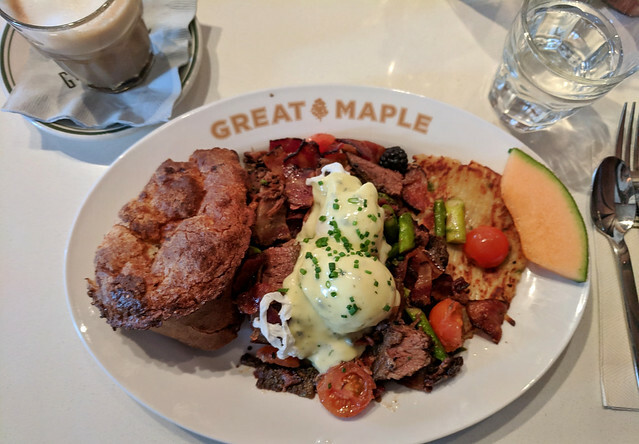 Early breakfast at Great Maple – HUGE portions (and prices to match). I had the beef brisket with English pop-over, asparagus, two poached eggs and bacon. Eric had the apple pie with Vermont cheddar and a side of crispy bacon. Delicious and filling. We made a reservation the night before but there was plenty of space at 8:30am on Sunday. For dinner we met a friend from college and her two sons at Del Sur Mexican Cantina. I had the carnitas burrito and a glass of red wine and Eric had a taco platter and a margarita. Laid back, tasty, and quick service. 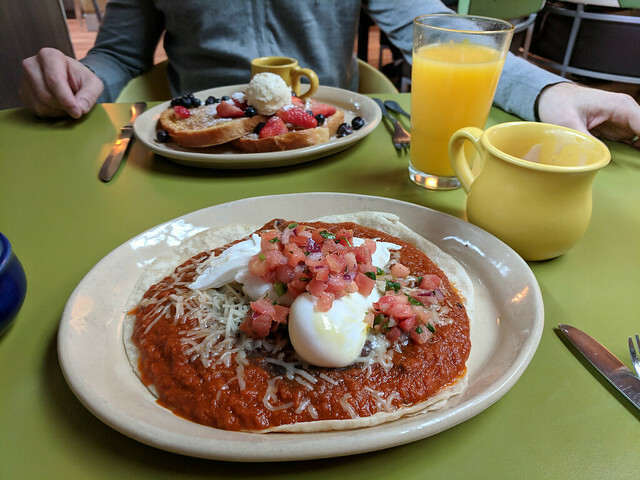 We started the day with breakfast at Snooze in Hillcrest. I had the huevos rancheros and Eric ordered the French Toast (plain w/ fruit). Found parking close by – not too bad at 8:30am on Monday morning. Without anything specific to complain about, this was my least favorite breakfast of the trip. After a late afternoon beer at Eppig Brewery, we headed to Pizza Bella Italian Bistro (found parking right out front). The restaurant was empty but the service and food were both good. We decided to get a bottle of montepulciano d’abruzzo when our waiter said we could cork and take what we didn’t finish. Perfect! I ordered the Mushroom & Co personal pizza and Eric had the Hawaiian. The crust was the right amount of chewy with good flavor. We ventured back into Hillcrest for breakfast at Breakfast Republic. 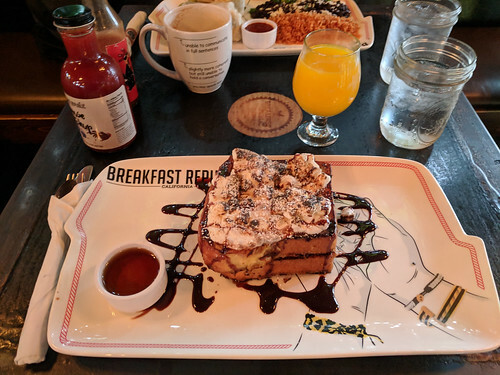 I had the massive breakfast burrito and Eric had the s’mores french toast. We sat outside in their covered patio area next to a heater so it was quite pleasant as it got crazy busy inside after we arrived. My latte here was the best of the trip. 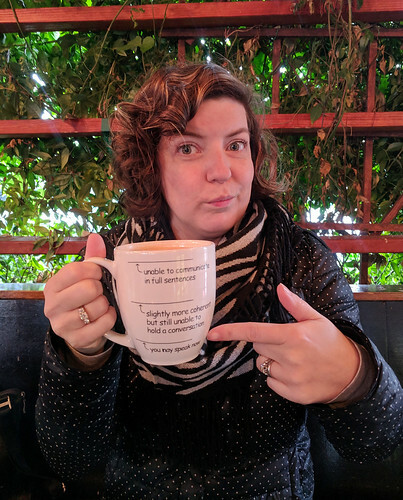 Plus, it came in a quippy mug. That evening we joined 20 of Eric’s colleagues for dinner at Stone Brewing. I ordered the lamb tacos to start (half of which I shared out) and got the steak tartare and bone marrow (delicious) and a glass of Pinot Noir for my main. Eric had the crispy Brussels sprouts starter (sprouts were a bit big and not done enough for us) and the brown butter gnocchi that came in a rich creamy sauce.